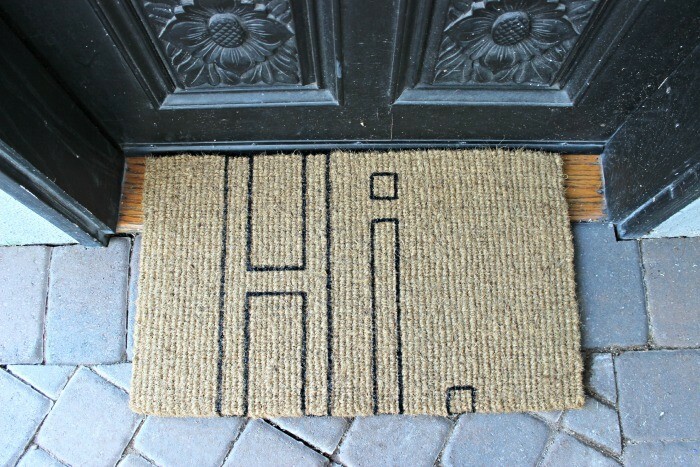 I don’t know about you guys, but I am oddly fascinated by everyones selection of doormats they choose for their house. I feel like it can say a lot about you and your personality, or the vibe of your home in general. I thought it would be fun to DIY a doormat, since I could never seem to find one I really loved. And let me tell you- it was about the easiest project I have ever done. I got this plain 100% coconut fiber mat, and went to town with some paint. To see the full tutorial- head on over to Bali Blinds blog today and see how easy and cute it is. Hi, I saw a bed I think on pinterest of an adult urban looking queen bunk bed. My husband and I are retired in a two bedroom unit and need sleeping room so our kids will come see us. The bed I saw was really cool for our urban unit. Is this by chance from your site or should I keep looking? My cell is 504 491 2202, we just moved to a very small place in Nashville and I’m afraid no one will come visit with only two bedrooms? I look forward to hearing from you.